(15595, Oklahoma Historical Society Photograph Collection, OHS). (12871, Oklahoma Historical Society Photograph Collection, OHS). Because peculiar circumstances existed in Oklahoma and Indian territories in the first half of the nineteenth century, railroad development lagged. The post–Civil War Reconstruction Treaties between the U.S. government and several Indian nations after 1866 stipulated that one north-south and one east-west railroad were to be allowed through the territories. Kansas demanded an outlet to the Gulf of Mexico, and plans for a transcontinental railroad from St. Louis to the Pacific along the 35th Parallel were being made at the same time. By 1870 already a total of 52,900 miles of railroads existed in the United States, with 1,350 miles in Missouri and 660 in Kansas, but none lay within Oklahoma. Only then did the Missouri, Kansas and Texas Railway Company (MK&T, or Katy, originally known as Union Pacific, Southern Branch) start building its line from Kansas toward Denison, Texas. Congress had stipulated that the first railroad to reach a certain point on the Kansas border, near Chetopah, was to have the right to cross through Oklahoma, and the MK&T won the competition with the Kansas and Neosho Valley company. The Katy reached Chetopah first. Originally, a land grant in Indian Territory was promised to the railroad in question, and the Katy investors fully believed that they were entitled to this land. However, after protests from the Indian Nations and much legal wrangling, their claim was finally dismissed. The Katy line reached the Red River late in 1872. Meanwhile the Atlantic and Pacific (A&P) had entered Indian Territory with a line from Pierce City, Missouri, to Vinita. Seeing the problems with the land grant claimed by the Katy, the A&P decided to stop there and wait for better times. Most of the traffic on the Katy line was interstate, chiefly Texas cattle transported north and grain transported south to the Gulf ports, as the region it passed through was sparsely populated and did not produce much freight. Only the coal mines around McAlester prospered because of the presence of the railroad, and there the Katy developed a lively coal traffic. By the 1880s Indian Territory was seen more and more as a barrier to commerce and traffic between the neighboring states. Congress now took measures to allow further railroad construction through Oklahoma. The St. Louis and San Francisco Railway (Frisco) was the first to profit in 1886–87 by building a line from Arkansas across the southeastern corner of Oklahoma into Texas. Next came the north-south line of the Atchison, Topeka and Santa Fe, opened in 1887 and running partly through the Unassigned Lands past Guthrie and to the future Oklahoma City. The Chicago, Rock Island and Pacific crept slowly south from Kansas toward El Reno, especially after the opening of the Unassigned Lands in 1889, and reached the Red River in 1892. Most of these lines followed old, established trade routes or cattle trails such as the Texas Road and the Chisholm Trail. In the 1890s other main lines, such as the Kansas City, Pittsburg and Gulf (later Kansas City Southern) passed through the Twin Territories. A few local branches were also built, but the Panic of 1893 put a temporary stop to most railroad construction. Foreign investors were instrumental in the financing of most of these railroad companies. The Katy was originally chiefly German and Dutch owned, the Frisco and Santa Fe were British and Dutch, the Rock Island was owned by American, British, and other foreign bondholders and shareholders, and the Kansas City Southern was almost completely Dutch owned. In the later regional development of Oklahoma, both in railroads and in oil, foreign capital continued to play an important role. 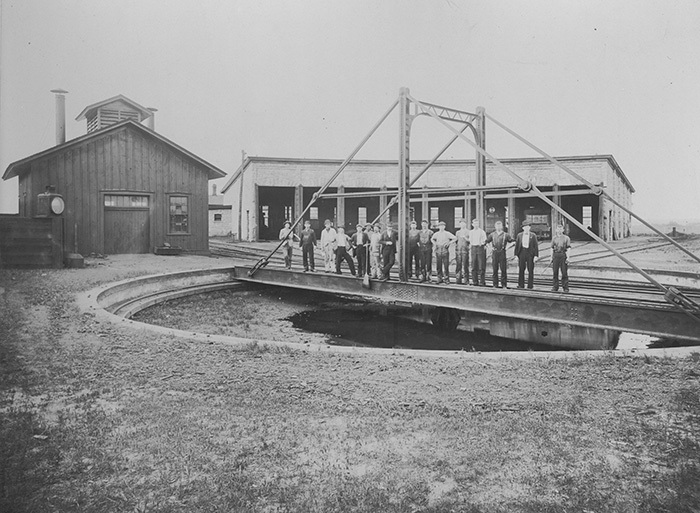 The great boom in railroad building only started circa 1897 when regional companies, generally sponsored by the existing mainline companies, started new construction. Between 1897 and 1907 Oklahoma was covered with a dense network of branches, often paralleling each other. Every company tried hard to get its share of the wealth, which led to a lot of over-construction. However, the gradual opening of the land to settlers from elsewhere and the discovery of oil in several places mandated regional transportation. The railroads were quick to oblige. The mainline companies already present in Oklahoma, that is, the Katy, the Frisco (successor to the A&P), the Santa Fe, and the Rock Island, all feverishly built branch lines into the oil regions and onto the vast prairies that were being converted into wheat-producing areas. The influx of people also necessitated many regional and local passenger trains. From a paltry 289 miles in 1880, the Oklahoma network had grown to 6,572 miles by 1920. But it is illustrative of the overbuilding that, of all railroads abandoned in the state before 1940, a full 75 percent had been built between 1897 and 1907. The constitution of the new state of Oklahoma of 1907 held a provision that no intrastate railroad could be sold to an interstate company, and this stricture impeded new construction for some years until the provision was abolished. Through lines that were then under construction or planned had to charter separate companies under Oklahoma law for a time. Some interstate companies such as the Frisco managed to clean up their corporate structure by completely buying up their Oklahoma subsidiaries just before the new constitution was to go into effect. 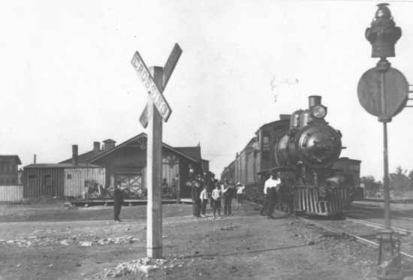 The Panic of 1907 also contributed to the end of large-scale railroad construction in Oklahoma, but despite this, a few lines such as the Kansas City, Mexico and Orient and the Wichita Falls and Northwestern (Katy) were being pushed forward just before World War I. More branches were being built into the oil fields, as these were successively discovered and developed, some as late as the 1920s. Even later, in the late 1930s the Santa Fe constructed lines in the Oklahoma Panhandle, chiefly for tapping the wheat-growing districts there. In the 1920s road transportation had already grown enormously with the opening up of outlying districts with passable roads. Much traffic had already been diverted from rail to road. Pipelines had siphoned off much oil formerly carried by rail. More and more travelers found the motorbus more convenient and comfortable than the once-a-day steam train. Railroads tried to modernize, of course, by substituting motorcars with gasoline or diesel engines for the steam locomotives, but not always successfully. The Great Depression caused havoc among Oklahoma railroads already weakened by competition. Abandonment of superfluous lines such as the Oklahoma Central and the Fort Smith and Western, lines that should never have been built, became more common, and many passenger schedules were abolished or replaced with mixed trains. World War II meant a reprieve, and traffic grew to enormous proportions. The establishment of military bases, the renewed working of oil and coal reserves, and the curtailing of road traffic through gasoline rationing caused an unprecedented surge in railroad transportation. But after the end of hostilities Americans turned en masse to the private automobile, and passenger trains were soon abolished all over the state. In the 1950s and 1960s many branch lines were abandoned and lifted when even revenues from freight were insufficient to maintain the track structure. As a result, by 1965 the Oklahoma mileage had shrunk to 5,570. But this was just the beginning, as the nationwide consolidation of interstate companies made some main lines superfluous as well. After years of insolvency the old Rock Island system finally closed down and was liquidated in 1980; some of its lines in Oklahoma were taken over by others. The Frisco was bought up by the Burlington Northern in 1980, and this new combination in turn merged with the Santa Fe in 1997 as Burlington Northern–Santa Fe. The Katy was absorbed by the Union Pacific/Missouri Pacific system in 1989, so that by the end of the twentieth century only Union Pacific, Burlington Northern–Santa Fe, and Kansas City Southern remained of all original mainline companies. In 1995 Oklahoma railroad mileage was down to 3,434, or about half of what it had been in 1920. Apart from local and regional passenger trains, some prestigious name trains either passed through or had their destination in Oklahoma. The Frisco with its "Meteor" of 1902 and the Katy with its "Katy Flyer" of 1896 competed for the traffic between St. Louis and the Southwest, until in 1917 both companies joined forces and operated together the "Texas Special" between St. Louis and San Antonio by way of Vinita and Denison. Another joint operation was the "Bluebonnet" of 1927, which ran between Tulsa and Houston. The streamlined "Firefly" of 1939, between Kansas City, Tulsa, and Oklahoma City was again a pure Frisco train. In the early sixties patronage fell disastrously, and the Katy ended all passenger service in 1965, but the Frisco continued some services for two more years. The other important passenger carrier, the Santa Fe, operated a number of trains through Oklahoma, including the "Kansas Citian" between Kansas City and Dallas, the "Tulsan" of 1939 between Kansas City and Tulsa, and the "Antelope" between Kansas City and Oklahoma City. The "Ranger" ran from Chicago to San Antonio by way of Oklahoma City until superseded in 1948 by the streamlined "Texas Chief." The latter train ran until 1971 when Amtrak assumed the long-distance passenger trains in the country. Lack of patronage caused its discontinuance in 1979, making Oklahoma one of the few states without passenger train service. This situation lasted until 1999 when Amtrak introduced a daily run from Oklahoma City to Dallas over the Santa Fe line through Purcell and Pauls Valley. The fourth of the big players in Oklahoma, the Rock Island, introduced its famous streamlined "Rockets" in 1937, of which the Kansas City–Dallas run passed through El Reno, and the Memphis-Tucumcari train through Oklahoma City. A postwar replacement of the first train was the "Twin Star Rocket," Minneapolis-Houston, again by way of El Reno and Chickasha, but bypassing Oklahoma City. All these trains were gradually abolished in the early 1960s. Preston George and Sylvan R. Wood, The Railroads of Oklahoma, Bulletin No. 60, The Railway & Locomotive Historical Society, Inc. (Boston, Mass. : The Railway & Locomotive Historical Society, Inc., 1943). Donovan L. Hofsommer, ed., Railroads in Oklahoma (Oklahoma City: Oklahoma Historical Society, 1977). Robert E. Riegel, The Story of the Western Railroads, from 1852 through the Reign of the Giants (Lincoln: University of Nebraska Press, 1964). John F. Stover, The Routledge Historical Atlas of the American Railroads (New York: Routledge, 1999). Augustus J. Veenendaal, Jr., "Railroads," The Encyclopedia of Oklahoma History and Culture, https://www.okhistory.org/publications/enc/entry.php?entry=RA004.